It's hard to confuse the Old Baldy Lighthouse with the other Carolina lighthouses that guard the Eastern Seaboard. The unique structure has undergone some interesting natural and manmade changes during its nearly 200 year lifespan, but many visitors believe that the unique structure, the aging exterior, and the long history only adds to the overall charm. 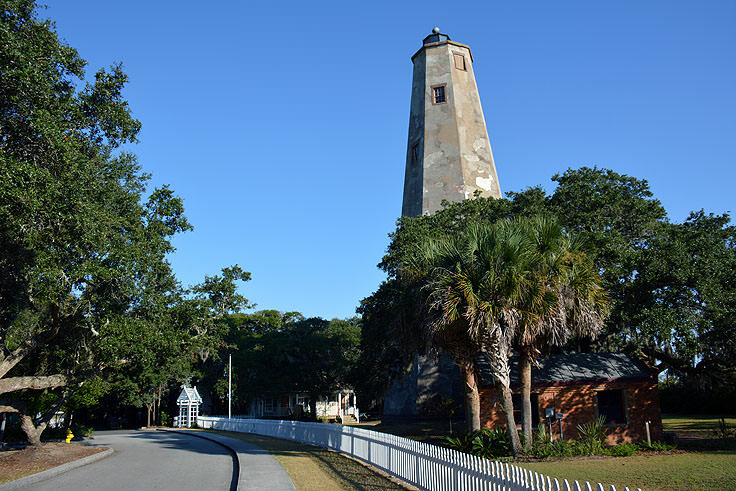 A must-see local attraction for day trippers and weeklong vacationers alike, the Old Baldy Lighthouse is easily one of the most interesting and admired sites throughout all of Bald Head Island. The first noticeable difference between Old Baldy and the other barrier island North Carolina lighthouses is the size, which is a completely intentional attribute. While the 110' feet tall lighthouse is dwarfed by its Outer Banks counterparts, which extend up to 210' feet high, the lighthouse was never meant to provide a beam to mariners well off the coast in the Atlantic Ocean. Instead, the goal for this lighthouse was to serve as a beacon for vessels passing through the Cape Fear River, ensuring that even in the dead of night or during stormy conditions, the respective ships didn't run aground along the wide riverbanks. The current lighthouse is actually the second lighthouse to stand guard over the Cape Fear River. The first one, which was built for $4,000 and was completed by 1774, was effectively built too close to the river, and in just 20 years, it became obvious that erosion along the riverbanks was going to become an immense problem. 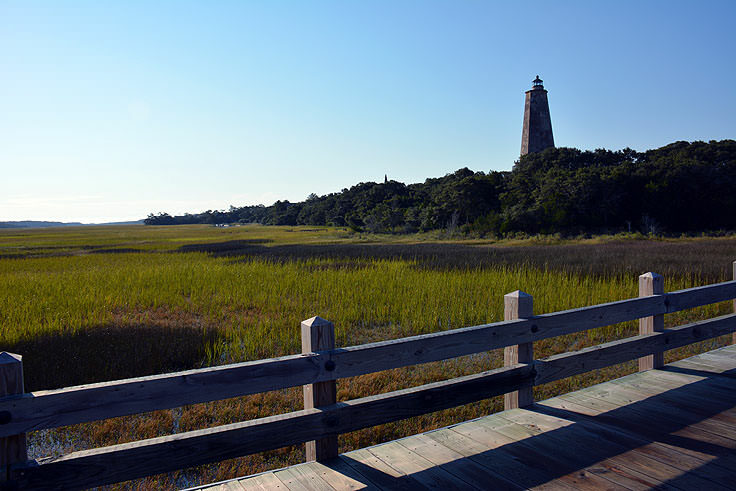 A second structure was created, Old Baldy, on a slightly-inland parcel of terrain on Bald Head Island that was easy to see from the river, but was well protected from storm surges or natural erosion. 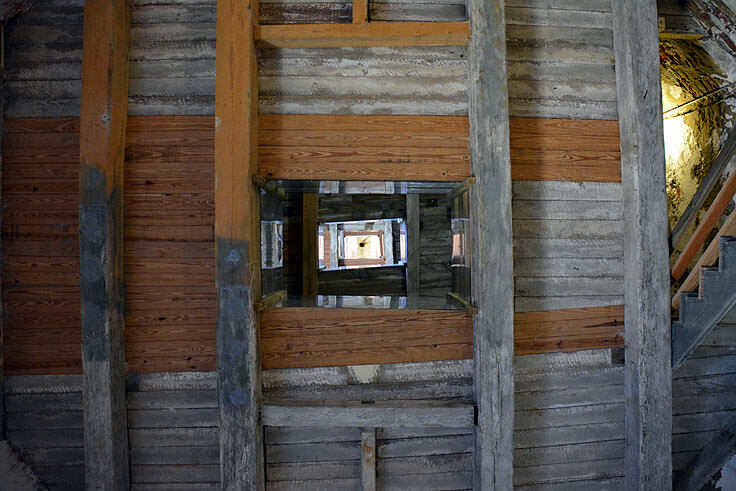 This new structure was built with brick and plaster, with a 26' foot wide base that tapers to 14.5' feet at the top, and a lantern that was equipped with 15 lamps and reflectors.The lighthouse was completed in 1817, and has stood strong ever since, making it the oldest original lighthouse in the state of North Carolina. Old Baldy was operational for over a century, providing virtually uninterrupted guidance to Cape Fear River mariners, with the exception of a dark period during and shortly after the Civil War. When the lighthouse was finally decommissioned in 1935, it still served a sporadic purpose during extreme national crises, and though it was no longer lit, the lighthouse even became a radio beacon during World War II to warn of conflicts with the German U-Boats which lurked just offshore.The lighthouse was relit in 1988 to the delight of visitors, and though it is no longer a navigational aid to Cape Fear River traffic, it is still a welcome and unmistakable beacon for Bald Head Island vacationers taking an evening stroll. As the oldest lighthouse in North Carolina, Old Baldy obviously shows some signs of aging. During its operational lifespan, the light keepers would whitewash the brick and stucco exterior every two years in order to protect it from the elements. (In fact, the original Old Baldy was always bright white during its years of operation.) After it was no longer in service, the white paint faded away, and large chunks of the stucco exterior would occasionally fall off the structure. These were filled in throughout the year, but with varying kinds of stucco that were completely different from the original 1817 materials available. Today, the exterior of the lighthouse resembles a patchwork quilt of dozens of different stucco varieties, an abstract and unintentional pattern that only adds to its allure and originality. The lighthouse is open seasonally to visitors, and generally closes during the winter months of January and February. Throughout the rest of the year, the dates and times of operation vary, from being open on just weekends during the spring and fall months, to being open daily from Memorial Day until Labor Day. Shoulder season visitors are advised to visit the Old Baldy Lighthouse's website for more information on visiting hours. 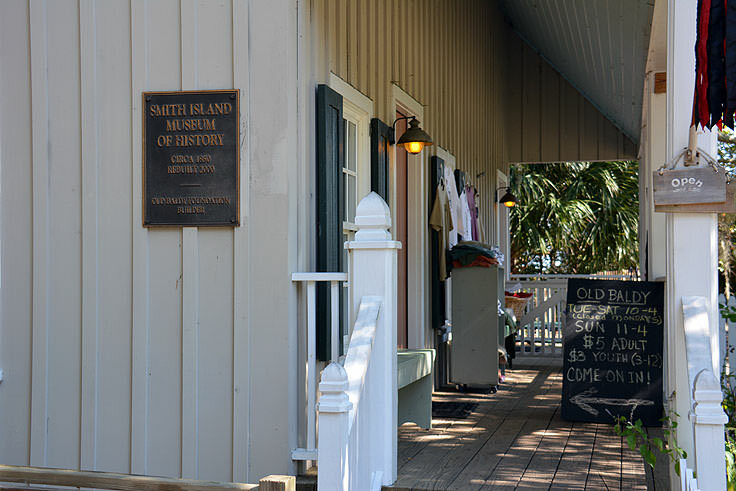 The first stop for a self-guided tour of Old Baldy is the Keeper's Cottage, also known as the Smith Island Museum of History. 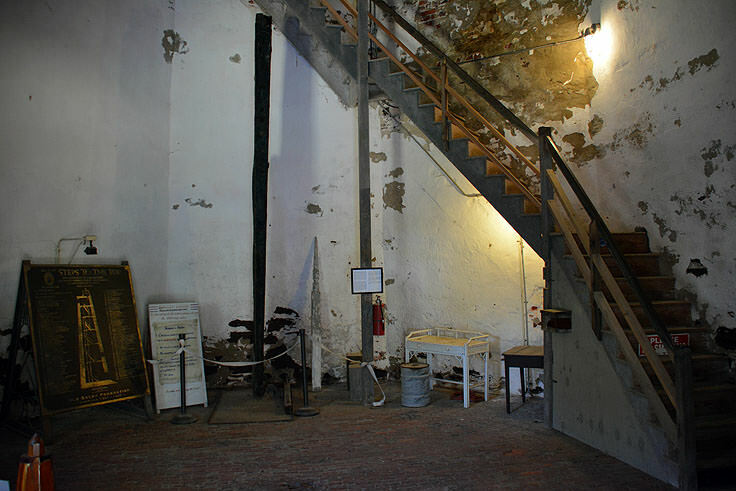 In this circa 2000 replica of the original quarters, visitors can see how the first keepers lived with a tour through the restored bedrooms and kitchen, and a variety of exhibits that outline the highlights of the lighthouse's history. 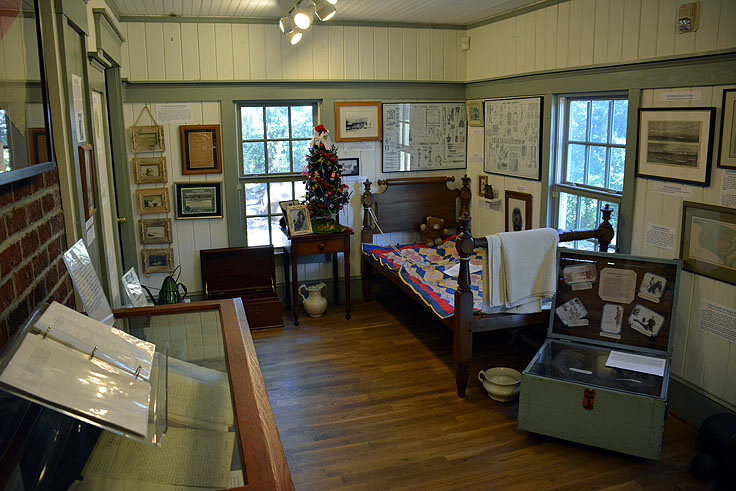 The cottage is based on original plans from the authentic Keeper's house that burned down in the 1880s, and also features an on-site souvenir shop with Old Baldy, beach and pirate themed mementos, gifts, books, maps, postcards, clothing, and decorative items. 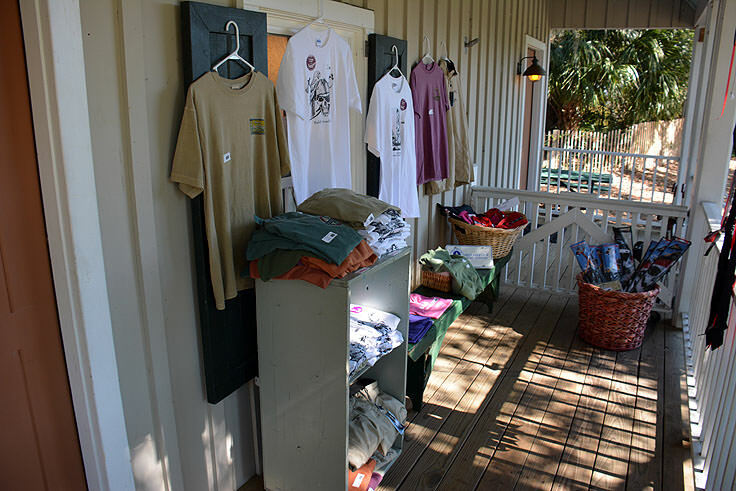 At the cottage, visitors can also purchase their tickets to step inside and climb the lighthouse to the very top. Tickets generally run around $5 for adults over 13, and $3 for kids aged 3-12, and are definitely worth the price. 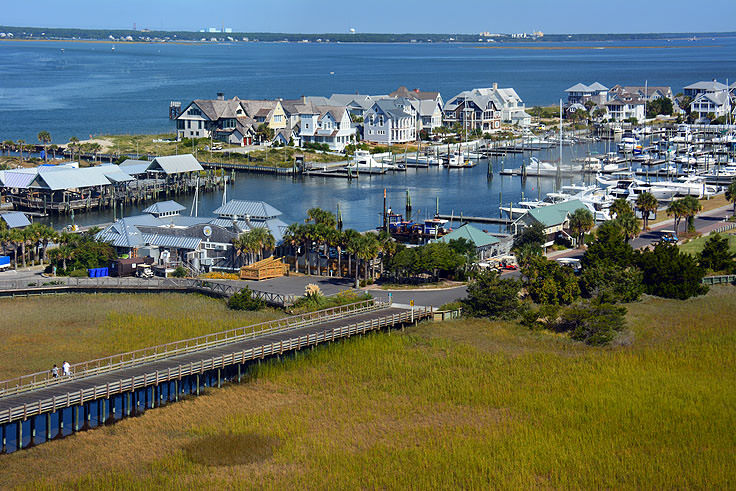 The 108 steps and occasional landings eventually lead out to one of the best views on the island, spanning the terrain from the Atlantic to the Cape Fear River and beyond. A camera is all but required for the adventure, and patrons who make the trek will be rewarded with vistas that are simply out of this world. 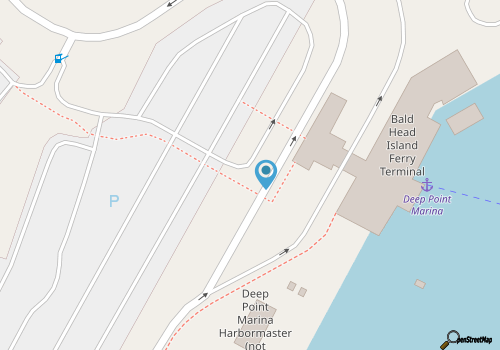 Special tours are also available for day-trippers from Southport, and these packages feature round trip ferry tickets, significant discounts at the gift shop, and even coupons for lunch at several local beloved restaurants. The Old Baldy Lighthouse is one of the most distinctive beacons in North Carolina for a variety of reasons. As the oldest standing lighthouse in the state, with the patch-worked repairs and rugged exterior to prove it, the structure is an icon in the area, and is quintessentially linked with Bald Head Island. Whether a visitor admires Old Baldy from afar, perhaps via the ferry ride from Southport or from virtually any region of the island, or tackles the 108 step climb to the top, the lighthouse is clearly a permanent and well-loved fixture in the local landscape. 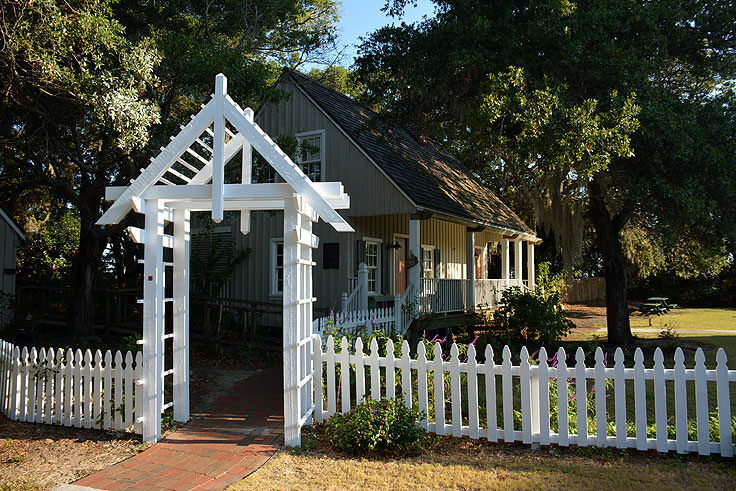 Visiting the lighthouse and the fascinating adjacent museum is a must for any visitor, no matter the duration of the stay, and is sure to be an awe-inspiring and altogether favorite aspect of any Bald Head Island vacation. 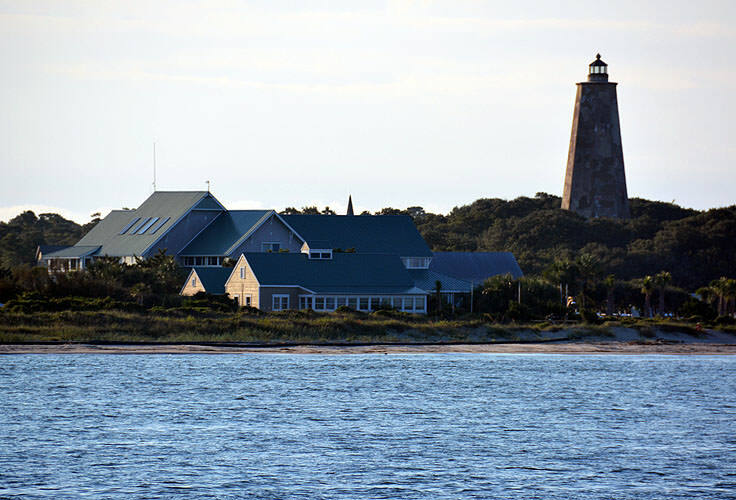 Impressive and imposing, while still fitting into the natural landscape, the Old Baldy Lighthouse is simply an incredible sight in a barrier island destination that's already brimming with charm and beauty around every sand dune.